Many people look within themselves, mining their thoughts and feelings for "the voice of God." And yet God has already spoken. The incarnate Word makes himself known in the written Word, and this communication keeps us personally connected to him. We need nothing else. Gene Veith makes this clear as he examines not only the sufficiency of God's Word, but also the flawed thinking of those who try to add to or detract from it. This passionate, personal booklet is a call for all of us to return to God's Word as our one and only authority in faith and practice. Basics of the Faith booklets introduce readers to basic Reformed doctrine and practice. On issues of church government and practice they reflect that framework otherwise they are suitable for all church situations. 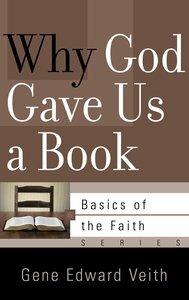 About "Why God Gave Us a Book (Basics Of The Faith Series (Formerly 'Reformed' Borf))"
Gene Edward Veith, Jr., (Ph.D. in English from the University of Kansas) is Director of The Cranach Institute at Concordia Theological Seminary. He is the Culture Editor of WORLD MAGAZINE and was formerly Professor of English at Concordia University Wisconsin. He is the author of numerous books, including Postmodern Times: A Christian Guide to Contemporary Thought and Culture, The Soul Of The Lion, The Witch and The Wardrobe, The Spirituality of the Cross: The Way of the First Evangelicals, and God at Work: Your Christian Vocation in All of Life.Postmodern Times received a Christianity Today Book Award as one of the top 25 religious books of 1994. He was named Concordia's Adult Learning Teacher of the Year in 1993 and received the Faculty Laureate Award as outstanding faculty member in 1994. He was a Salvatori Fellow with the Heritage Foundation in 1994-1995 and is a Senior Fellow with the Capital Research Center. He was given the layman's 2002 Robert D. Preus Award by the Association of Confessional Lutherans as "Confessional Lutheran of the Year."